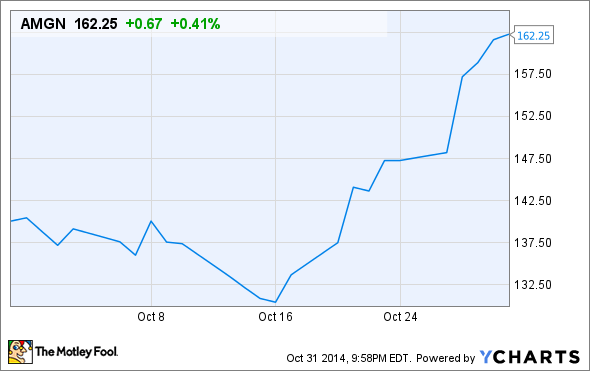 Amgen was among the best biotech stocks in October in terms of share price performance. Find out why. What: Shares of biopharmaceutical behemoth Amgen (NASDAQ:AMGN) surged 15% in the month of October, based on data from S&P Capital IQ, primarily following a positive earnings report and amid speculation that the company could split itself into two components in order to unlock shareholder value. So what: Earnings continue to be a positive story of late for Amgen, with the company reporting a 6% increase in global sales to $5.03 billion and a huge 19% increase in profit per share to $2.30. Both figures handily topped Wall Street's estimates and led to rejoicing from investors. Specifically, Amgen singled out blood cancer drug Kyprolis, white blood cell enhancing drug Neulasta, and osteoporosis prevention drugs Xgeva and Prolia for its strengthening results. Kyprolis grew 21% from the sequential second quarter, while, year over year, Neulasta sales improved 5%, Xgeva's grew 22%, and Prolia hurdled 43% higher. Amgen also proactively trimmed its costs by reducing its headcount. Following the announcement in July that it was cutting approximately 15% of its workforce, Amgen noted that it would shed another 5% of its workforce this past quarter. Though headcount reductions are rarely welcomed, it has boosted Amgen's operating margin by 690 basis points thus far. The other factor involved in Amgen's meteoric surge was Third Point's Dan Loeb who suggested that Amgen split into two separate entities in order to unlock shareholder value. Loeb's suggestion, which was divvied out in his hedge funds' quarterly newsletter to investors, is for Amgen to split into a mature company with its legacy products, and a faster-growth company with its promising pipeline candidates. In other words, do something similar to what Theravance and Theravance Biopharma recently did. Loeb believes Amgen is trading at a significant discount to its U.S. pharmaceutical peers. However, Amgen's management team shot down the idea of splitting itself up, at least for now. Now what: Perhaps the most important thing to come out of Amgen's earnings report, aside from rumors of a split or another solid quarter of growth for its legacy products, is that it remains on track to deliver data on nearly a dozen late-stage drugs this year. Amgen's pipeline is looking as robust as ever, with a number of drugs in line to treat widespread, chronic conditions. The downside, of course, is that the Third Point rumors pushed Amgen's stock price through the roof this past month. Third Point views Amgen as undervalued relative to its peers, but I just don't see it that way. Going forward, I do see plenty of catalysts that could spark Amgen, but believe most of these near-term events are already factored into its share price. I'm remaining on the sidelines and betting on an eventual pullback once these rumors about a split die down.